This Canada-France-Hawaii-Telescope (CFHT) image shows the ultra-bright supernova PS1-10afx, 9 billion light-years from Earth. The super-bright star explosion was magnified by a cosmic lens, scientists say. Image released April 24, 2014. An incredibly bright supernova spotted in 2010 has been the subject of a stellar mystery until now. A new study shows that the superluminous supernova, called PS1-10afx, was not a new kind of super-radiant stellar explosion, as some scientists thought. Rather, it was the light from a well-studied type of star explosion that just happened to be magnified 30 times by a well-placed cosmic lens. 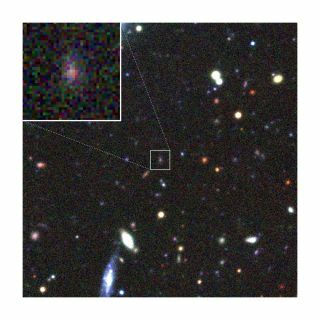 Scientists think that another galaxy positioned between Earth and the supernova acted as a gravitational lens that warped space-time, magnifying the brightness of PS1-10afx, a type 1a supernova located about 9 billion light-years from Earth. The new supernova finding may help researchers gather more evidence to investigate the expansion of the universe — yet another cosmic mystery. You can watch a video detailing the supernova discovery here. This illustration shows how the light from a supernova like PS1-10afx, located more than 9 billion light-years from Earth, could be magnified by a cosmic lens in the form of a galaxy positioned between the planet and the distant supernova. Image released April 24, 2014. Scientists were surprised to see the incredible luminosity of PS1-10afx, although its color was the same as that of type 1a supernovas. Because the gravitational lens wasn't immediately apparent, some scientists thought the bright supernova actually represented a new kind of stellar explosion. "PS1-10afx is like nothing we have seen before," Robert Quimby, of the University of Tokyo's Kavli Institute for the Physics and Mathematics of the Universe and lead author of the new study, said in a statement. Quimby and his collaborators used data collected after the extreme brightness from the supernova faded, to hunt for the galaxy that may have acted as a lens. They found the telltale signature of the cosmic lens. Instead of seeing one set of gas emission lines from the supernova in his data, Quimby and his team saw two — evidence of the gravitational lens in the foreground. This image shows the supernova PS1-10afx and its relation to Earth. The lower panel displays the galaxy responsible for magnifying the light of PS1-10afx and Earth. Image released April 24, 2014. The lensing galaxy's light was washed out by the bright appearance of the supernova and its host galaxy. "I think Quimby and company have done a very nice job of pursuing the curious case of PS1-19afx," said Robert Kirshner, an astronomer at the Harvard-Smithsonian Center for Astrophysics who is unaffiliated with the new study. "They've convinced me there's a lens that made this supernova appear extra bright." "The next step is to get a really good Hubble Space Telescope image of the host galaxy, and see if you can pick out the lens galaxy, which must be superposed on it," Kirshner told Space.com via email. Understanding this kind of lensing could help scientists learn more about the nature of the universe and even test Einstein's theory of general relativity. While type 1a supernovas are well understood, this kind of lensing could help scientists measure the expansion of the cosmos spurred on by dark energy, a mysterious substance that makes up nearly 75 percent of the universe. "Unfortunately, we were not introduced to the supernova until long after it faded away, so we lost the chance to do the follow-up observations that would be required," Quimby told Space.com via email. Although it's too late to do this kind of research on PS1-10afx, scientists now have more information about how to investigate these kinds of lensed supernovas in the future. Quimby and his team also have figured out a way to find these "strong lensing" events more often. "Our new approach allows us to find unresolved strong lensing events produced by such low-mass galaxies," another author of the study, Masamune Oguri of the University of Tokyo's department of physics, said in a statement. "Thus, the expected number of gravitationally lensed Type 1a supernovae to be found in future surveys increases by an order of magnitude." The new supernova study appears in this week's issue of the journal Science.